–The Blackout is currently available on Amazon for Kindle and in paperback. Molly lives in the Northern part of Florida in a nice neighborhood. Her husband, Gary, is a pilot and is doing his flight rotation when a solar flare hits. One of her neighbors, Jimmy Jean, retired military, has been warning them about a CME possibility for a number of years. So, yes, he is prepared. This is the story of the “Wanderers” and the story of the other survivors trying to make it after the event. Absolutely loved Gary’s part of the story and the kindness he was shown by complete strangers. And, an outstanding ending which is not the typical scenario. (5 stars) First of all, this is a great story. I am a lover of apoc and post apoc story’s. I tend to gravitate towards novels that have more survivalist aspect but this story really captured my focus. Great love story. Hardly no grammatical errors. Spoilers after this. The one thing I do wish is that the book had continued after the main characters were reunited so we could get some reward for seeing them back together. It seemed like a very abrupt ending. It would have been nice to see how the main characters reacted when they told each other their story. Other than that this was a great book. If you are on the fence about wether to buy it, just buy it! You wont be sorry! (5 Stars) The Blackout by Stephanie Erickson is an exciting, thought-provoking, entertaining read. The story is plausible, believable, and relevant.. It is obvious that the author took great care in researching the devastating effects that a solar event of this magnitude would have on our way of life. If you’re looking for a truly enjoyable book that leaves you asking the question “what really matters to me?”, then I would definitely recommend The Blackout by Stephanie Erickson. (5 Stars) Stephanie Erikson’s debut novel is a delight. It’s a book that imagines what the world would be like without electronic devices, following a catastrophic solar flare. The global world shrinks to the local, to neighborhoods, which must learn how to survive without the conveniences of automobiles, internet or phone communication, hospitals, grocery stores, et cetera. What happens to ethics in such a world? Erikson’s novel offers an answer to this question, as her characters exist in a seemingly hopeless world without entirely losing hope. 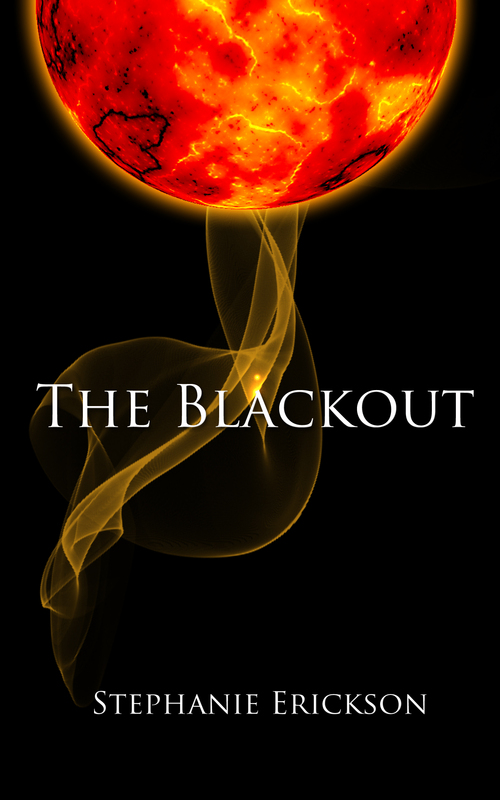 (5 Stars) I really enjoyed reading The Blackout by Stephanie Erickson…granted, I’m not an expert on electronic devices and how they would work or not work if there was a blackout..like some readers evidently are…..but I truely enjoyed the book and with the ending as it is, I’m hoping for a sequel or maybe even a trilogy. Stepanie made the characters come to life and I would like to follow them through their future journeys. (5 Stars) I enjoyed reading this first novel by Stephanie Erickson. (I’m glad I got the chance to read it before other reviewers gave so much away!) Unlike other “doomsday” books in SciFi tradition, this story is believable with characters who act like real people. I look forward to the next book by this new author.